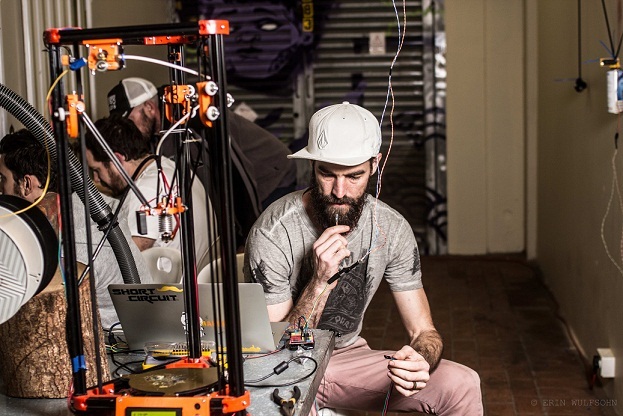 The Durban University of Technology’s fourth annual DigiFest takes place from November 6 to 11, featuring a series of live art activations, innovations, exhibitions, discussions, workshops, music, poetry, dance and drama as well as craft and street food markets. DigiFest 4, is a public event that looks to celebrate the creative spirit through multimedia projects from disciplines such as visual and performing arts and promotes a collaboration across art, science and technology. Opening night takes place on November 6 and will highlight a collaborative live audio visual performance coordinated by Johannesburg-based electronic artist, cultural activist and producer, Marcus Neustetter and featuring a selection of local artists. Sue Gollifer, the chair of the ISEA international board, will introduce ISEA as a precursor to ISEA2018 (International Symposium on Electronic Art), which takes place in Durban next year. The Alumni and Development Department will be running a competition to pledge support for the Missing Middle campaign. In a new fashion, the festival will host a series of events across venues in Durban. The KZNSA Gallery in Glenwood comes alive on November 7 with DUT Fine Art Department exhibition, and an installation by Bongumenzi Ngobese, examines elements of sounds, which address issues of context through video. The night features a special performance by Zimbabwean multi-media artist Robert Machiri. An evening of style takes place at the DUT Brickfield Campus on November 8, with a multi-media fashion experience featuring leading innovations in the fashion and textiles department joined by a special guest DJ to be announced. B-Tech students’ final portfolio exhibitions will be on display and student run pop-up shops will have jewellery and craft on sale. A breakaway session on November 9 at the Green Camp, a creative hub of urban farming and green rehabilitated art in Umbilo, features the premier of the film entitled Street art and mural art as visual activism in Durban by artist Mook Lion. A Sketch is an installation of bricolage video work by Glenn Adendorff and Rob Da Banka closes the night with vinyl loops. The City Campus explodes with creativity on November 10 from 10h00 with a host of prominent speakers in the world of arts, design and digital media. In the courtyard, students entrepreneurs showcase their products and innovations. Exhibitions open throughout the afternoon and feature projects from various departments including graphic design, jewellery, interior design, journalism and video technology as well as individual exhibitions from range of young local artists working in the digital arts. The Talk Fest at the City Campus that day includes speakers Sheetal Cross (RSA) - Virtual Reality, Kirstin Wiedow (Namibia) - NUST-DUT Polar Project, Mari Pete (RSA) - Glitches in ELearning, Prof Oliviera (Brazil) - LabInter Project; Tegan Bristow (RSA) - Fakugesi Festival, and Arjon Dunnewind (Netherlands) - Frankenstein in the Garden of Eden. The Makerspace hosts a workshop that will allow a fixed number of participants the opportunity to collaborate and build doodle bots. This session will open to all on a first come basis, and submissions can be done via digifest@dut.ac.za. The day culminates with the popular PechaKucha, a gathering of inspired minds who presents ideas, thoughts, dreams and creative insights. This year some of the speakers include Llwellyn Makhanya (photographer), Richard Gevers (Civic Data Activist), Mark Stuart (developer), Brad Vause (musician, app developer), Zwelisha Giampietri (multi-media designer), Sihle Mthembu (journalist), Bylwansta (designer and rapper) and more. On November 11, the Steve Biko Campus becomes the focus with live performances in the form of poetry and open mic sessions, a cross-platform theatrical piece entitled Duped and a hip hop battle closing the evening with a great line-up of music by ByLwansta, Gaba, Rude Boyz, Moonchild, Sibot and Toyota and Sparks Bantwana. A highlight of the DigiFest 4 this year is The Digital Battle, which will take place at the DUT Gallery on November 11. This Digital Battle is a live head-to-head design tournament where participants flex their skills in front of an audience and compete for some great prizes. The competitors will engage in a battle of their choice including 2D design, animation, character design and video editing. Entries are now open and close on November 8. Head over to www.designbattles.co.za/durban.html to sign up. All are welcome and entrance is free with exception of November 11 events at Steve Biko where tickets will be free for students and R40 for the public.